The change in total revenue as a result of producing one additional unit of output. The revenue that a company generates over what it previously generated for each additional unit of output. For example, suppose a company generates $1000 in revenue from 100 units of a product (in other words $10 per unit). In order to sell 101 units it may have to reduce its price to $9.99 per unit. In this case, its revenue becomes $1008.99. Thus, the marginal revenue is $8.99. The extra revenue generated by selling one additional unit of a good or service. For example, if a firm can sell 10 units of a product at a price of $25 per unit, total revenue is $250. If, in order to sell 11 units, it must reduce the price to $24, total revenue rises to 11 × $24, or $264. Thus, the marginal revenue of the 11th unit is $264 - $250, or $14. the extra revenue that is obtained by a firm from the sale of additional units of product. 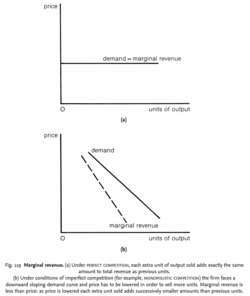 If firms are profit maximizers they will seek to equate marginal revenue with MARGINAL COST to establish that price output/sales combination which yields an optimal return. See BUSINESS OBJECTIVE. Fig. 119 Marginal revenue. (a) Under PERFECT COMPETITION, each extra unit of output sold adds exactly the same amount to total revenue as previous units. Under conditions of imperfect competition (for example, MONOPOLISTIC COMPETITION) the firm faces a downward sloping demand curve and price has to be lowered in order to sell more units. Marginal revenue is less than price: as price is lowered each extra unit sold adds successively smaller amounts than previous units. the addition to TOTAL REVENUE from the sale of one extra unit of output. Under conditions of PERFECT COMPETITION, the firm faces a horizontal DEMAND CURVE at the going market price (marginal revenue = price). See Fig. 119 (a) . Marginal revenue interacts with MARGINAL COST in determining the level of output at which the firm achieves its objective of PROFIT MAXIMIZATION. See AVERAGE REVENUE, ELASTICITY OF DEMAND, KINKED DEMAND CURVE, MONOPOLY. In the upper part a) we find the equilibrium point where marginal revenues and costs are equal. As argued above, marginal revenues decrease for both clubs and with it talent demand ([t.
9) This is the case as long as marginal revenues are positive at [R.
If players in a competitive player market under profit maximization are paid according to their marginal revenue (their contribution to the team's revenue), does it mean that players in a win-maximization league are overpaid, that is: above marginal revenue? Marginal Revenues by Market Size (Effect of Winning an Additional Game on Season Revenues) Marginal Revenue from Gross Revenue Win Percentage Smallest 25th 75th Largest 0. On this graph it is possible to see the link between the growth in marginal revenues of clubs through sports entertainment and the level reached by the stars' salaries. The work of Smith and Smith (1988), Smith and Ellis (1990), Clark and Hegji (1997) and others clearly demonstrates that computer spreadsheets can be used to model standard micro economic concepts such as marginal revenue, marginal cost, and value of marginal product. I first estimate the effect that spending on different activities has on group revenues and then calculate marginal revenues given mean spending levels. It implies that by raising production, large firms can benefit from higher after-tax marginal revenues. The first two terms in equation (2) describe the marginal revenues in segments 1 and 2, respectively. the marginal revenues across different markets will be equalized at the optimum.